Goeido n’est plus qu’à deux victoires de conserver son rang d’ôzeki après avoir vaincu Shodai. Goeido, qui a besoin de remporter huit combats pour rester ôzeki, a dominé Shodai (4-3) et conquit sa sixième victoire consécutive après sa défaite lors de la journée d’ouverture. 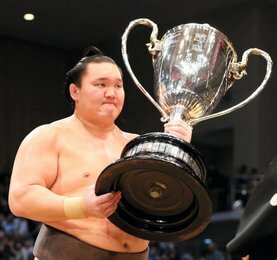 Avec trois yokozuna et deux ôzeki forfaits – une première depuis près d’un siècle – Goeido est maintenant deux victoires devant Harumafuji (4-3). L’unique yokozuna en compétition a aujourd’hui vaincu Shohozan (4- 3). La veille, Goeido avait sorti Onosho (6-1), infligeant au maegashira sa première défaite du tournoi. Aujourd’hui, c’est Shodai qui était complètement à la merci de l’ôzeki. Demain Goeido affrontera le komusubi Tamawashi (3-4), contre lequel il détient un record de carrière de 5 à 6. Onosho, qui a battu Hokutofuji (3-4), reste à égalité avec Goeido, Daieisho et Daishomaru, tous à 6-1. Avec sa victoire sur le maegashira 1 Shohozan, Harumafuji a réussi à obtenir sa cinquième victoire du championnat. 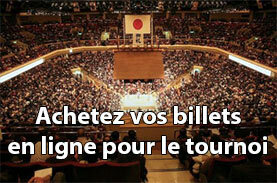 Les deux sekiwake se sont imposés, Mitakeumi (4-3) a battu Tochiozan (1-6) et Yoshikaze (3-4) a vaincu Tochinoshin (1-6). 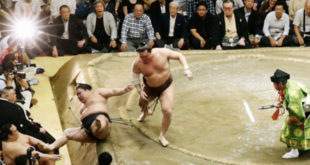 Goeido is two wins away from retaining his ozeki rank after defeating fifth-ranked maegashira Shodai at the Autumn Grand Sumo Tournament on Saturday. Goeido, who needs a winning record to stay an ozeki after this tournament at Ryogoku Kokugikan, overpowered Shodai (4-3) to roll to his sixth straight-victory after losing on opening day. 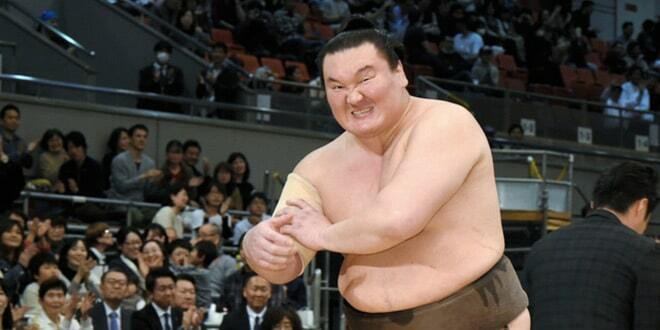 With three yokozuna and two ozeki out of the meet for the first time in nearly a century, Goeido is now second in rank behind only yokozuna Harumafuji (4-3), who won for the second day in a row by ushering Shohozan (4-3) out of the ring. A day earlier, Goeido dealt rising No. 3 maegashira Onosho (6-1) his first defeat of the basho and followed up Saturday with another swift win, this time against Shodai, who was completely at the ozeki’s mercy. On Sunday, the midpoint of the 15-day tournament, Goeido will face komusubi Tamawashi (3-4), against whom he holds a 5-6 career record. 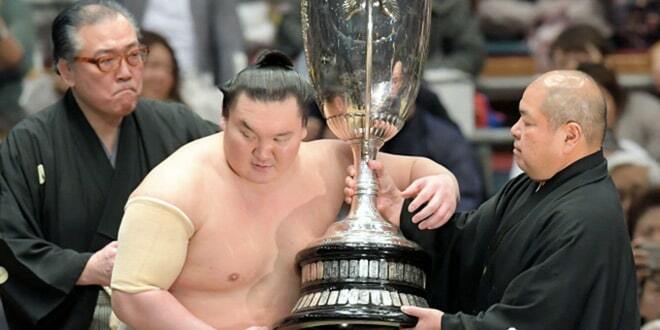 Joining Goeido at the top with six wins are Onosho, who beat second-ranked maegashira Hokutofuji (3-4), No. 11 Daieisho and No. 12 Daishomaru, who toppled Sadanoumi (0-2-5) and Tokushoryu (1-6), respectively. 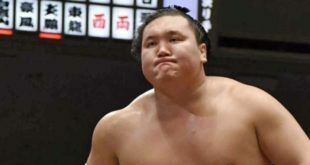 With victory over fourth-ranked maegashira Shohozan, Harumafuji has managed to move back ahead in the win column but had lost three straight until Friday, when the Mongolian steadied his ship by getting the better of No. 3 maegashira Chiyotairyu (5-2).